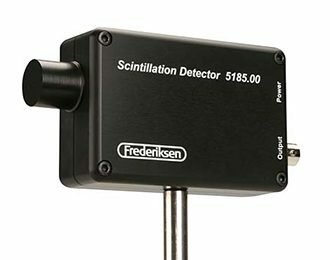 This detector is an ideal companion for the Multi-Channel Analyzer (SF-7222). It is powered directly by the MCA unit. The cesium iodide scintillation crystal used measures 6 x 6 x 15 mm, which provides an exceptional angular resolution, making it an excellent choice for the Compton Scattering Kit (SF-7224). It is also included as part of the Complete Compton Scattering (SF-7277). Energy resolution (full width at half maximum) is approx. 7% at 662 keV (Cs-137) and is 5% at 1333 keV (Co-60). The detector’s bias voltage is software-controlled (through the MCA) in order to keep the gain independent of temperature.